I’ve never liked celery. To me, it’s like eating green water held together with a lot of fibers. Unless it’s filled with peanut butter or cream cheese, you can keep it. The only time I ever buy a bunch is when I’m making stock, which is a shame, because that only requires a stalk or two, and the rest sits in my refrigerator until it wilts and I have to throw it out. And I hate throwing food away. A lot of other people in France must feel the same way I do because at the markets, the vendors will gladly slice a bunch of green celery in half and sell you just part of one. Yes, I’ve seen those recipes for things like braised celery and boiled celery, which allegedly are the most wonderful ways to transform that ho-hum vegetable into something edible. I’ll have to take their word for it, because when I read through those recipes, no matter how excited the authors are about discovering a new way to prepare celery, the finished dish still sounds like it’s going to taste like rolled-up soggy newspaper. Until I’m proved wrong, for now I’ll stick with celery root, which is a whole other story. I love celery root, which is sometimes called celeriac. It has a woodsy, celery-like flavor, but is far more concentrated and less-watery than its above-ground cousin. It’s pretty easy to find gnarly roots at markets in France because they’re quite popular in it’s uncooked state, where people use them to make the classic céleri rémoulade. 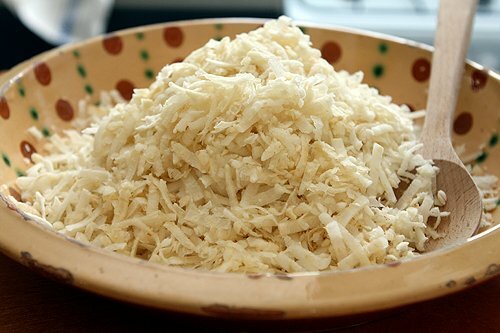 Outside of Nice, you’ll find grated raw celery root as part of a trilogy of salads on a popular starter, known as salade de crudités (raw salads), which generally includes salade de carottes râpées and perhaps some radishes with butter and salt. But it’s often just served on its own. I know you where thinking that I was going to tell you that you absolutely had to use homemade mayonnaise and that if you didn’t make your own mayo, you were a bad person. But it’s just fine to use a store-bought brand. (If you want to make your own, you can use this recipe for eggless mayonnaise or aïoli, omitting the herbs and garlic, respectively.) Some are better than others, and the best brands in France have a healthy dose of Dijon mustard in them. More important than the mayonnaise, you’ll want to use a grater that will make the celery root pieces roughly the size of wooden matches. If they’re too small, they’ll lose their crunch once dressed. In France, they have these wonderful Moulinex rotary hand graters which, unfortunately, aren’t available in the states. Sometimes you can find them on auction sites; they’re called a mouli-julienne. Folks in the states keep asking me where they can get one* and I encourage all of you to start a letter writing campaign because my suitcase, when I head back to the states, is already too full of chocolates, macarons, and salted Breton butter, to carry French vegetable graters. If you have a grating disk for your food processor or stand mixer, you can use the one with the largest holes. Or just grate or julienne the celery root by hand. The French aren’t known for liking heavily spiced foods, but they love Dijon mustard. Since brands vary—some are extra-forte and others less-so, you can use as much, or as little as you like. Ketchup is still sneaking on the scene, and is no longer exclusively thought of as très Américain (as much as they’d like us to believe…), but it’s not going to replace the little pot of mustard on the table in cafés and bistros that serve traditional French fare. Céleri rémoulade is generally not futzed with too much, which is fine with me. I don’t think everything needs to be ‘improved’ or fooled around with. However some people will add a bit of cornichons or chopped capers, and it’s become a bit au courant to add a julienne of Granny Smith apples to the mix. If you want to add some chopped parsley to it, you can. But add it as if it’s more of an afterthought than an ingredient. I often just add a flurry of chopped leaves over the top, and that’s that. 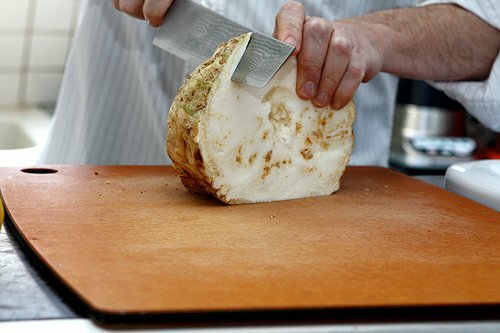 Celery root is pretty easy to prepare, but does discolor a bit once sliced open and grated. So make the dressing before slicing and grating the celery root, for best results. I like mine really mustardy, so I use a fairly large amount. 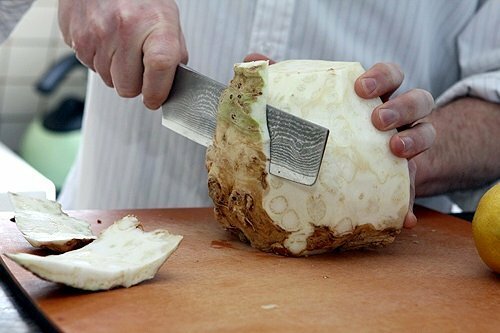 If you’re unsure, start with less; you can add more, to taste, when the salad is finished.To peel celery root, lop off the root and opposite end with a chef’s knife. Then stand the round root on a flat end then take the knife and cut downward, working around the outside, to slice off the tough skin. In the states, celery root are often smaller, and have more complicated roots, and you’ll need to cut a bit deeper to remove them. 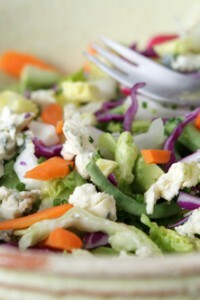 Note: If the salad is too thick, you can add a few spoonfuls of whole or low-fat milk to thin it out. Cut celery into batons and it loses most of its stringy quality – I love the crisp coldness of raw celery in any shape though. I consider it an essential ingredient in egg and chicken salad, too. Now, about that pork tenderloin next to your remoulade….? I’ve never tried celery root, but love crunchy slaw-y type salads. I don’t often see celery root in the store in the south bay SF, but do see a lot of jimicama. Is the taste and texture at all similar or should I just wait until I hunt it down? I would love to try this. I am already getting ahead of myself imagining lots of possibilities for additions! Beautiful pictures, I swear I can taste it! 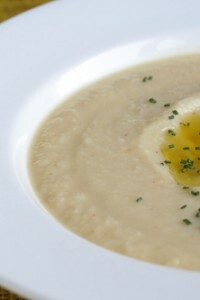 I recently cooked with celeriac for the first time and made a simple Celeriac Soup which was delicious. Lovely celery flavour without any of that stringy business. I love celeri remoulade (en bonne française) and I sometimes find it at my local greengrocer, where – more often than not – I am asked what it is and how I prepare it: Italians use a lot of stalk celeri in their sauces (and I can’t be bothered with it either) but are yet to discover the delights of celeriac. The influx of Romanian (and Eastern Europe) settlers in the suburbs of Rome means that I can now find more “exotic” vegetables at the market. If you do make your own mayonnaise (one with eggs) you can shape little cakes of celeri remoulade and fry them gently to make a nice side dish for pork roast (you might want to add one more egg to the mix, though). I’m extremely excited to try this! I keep getting celery root and just using it as well, uhm, celery : ) I will be trying this very soon – thanks! God, I love your blog. Thanks for the great info. I plan to make this and several other on your site, yummmmm! Sounds absolutely delicious! I am excited to give this one a go! Just a tip–you can freeze chopped celery for use in stocks (also the leaves). I often do it, because I don’t like it raw either. Since it’ll get cooked and mushy anyway, it works. I chop it and throw it in a ziploc freezer bag for making soups or stocks later. I know it’s cheap, but I still don’t like to waste. For bringing Paris and your food and your wonderful writing to my PC and me, thank you so very much. 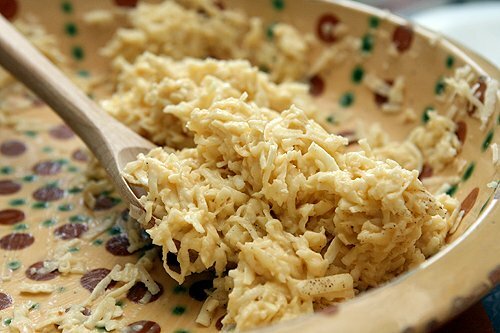 In Poland we make a very similar “side” dish with the celery root, but very often a lighter version – using light cream or even plain yoghurt instead of the mayo and no mustard. What we get is a lovely light salad that goes very well with most meats. Often people add raisins into it, but as I am not a great lover of raising I am happy with a simple version. I love celery stalks with tuna cream : a can of natural albacore tuna, a bulgarian yogurt, mayonnaise, garlic, herbs, and a red softpepper finely diced. I use the large base of celery stalks pour faire trempette, it’s very fresh and tasty. I discovered celery root with my in-laws, first it was boiled in pieces and eaten cold with garlic home made mayonnaise. It was a huge discovery for me and since then, I usually buy one big root every week. Your rémoulade is slightly different than mine, but I suspect yours would improve some aspects from mine that I was not satisfied with (I do not add mustard nor lemon juice for example). i’ll try this for sure, thanks ! As for your sentence “and it’s become a bit au courant to add a julienne”, I think you did not mean au courant (aware), but courant (common) ? Remoulade and a good veloute (with curry croutons) are my favourite uses of Celeriac… and my mother goes wild for it too. Strange it isnt that popular on this side of the channel, I think everyone gets put off by the ‘celery’ component in the name. Celery root remoulade has been one of our favorite salads for years. I still subscribe to Julia’s recipe in “Mastering”. It takes a few minutes longer, but it’s worth the effort. Anyone looking for a Mouli Julienne can order one through Amazon. I have been making this every week for the last month. I added plumped currants that had been soaked in a red wine vinegar the last time I made this and it was a nice addition. I just use a food processor to shred mine. Granted it could be a finer shred but much easier than wrestling with a box grater. That shredder vaguely reminds me of a salad shooter. Remember those?! *Totally* hearing you on the celery. I love vegetables but celery is the mankiest thing ever. However, like you, I do use it for stock, and if you have some left over, you can dice it and freeze it for bolognaise or something. Happy you posted this because I have (smug smirk ;P) some leftover mayonnaise in the fridge and was wondering how to use it up before it turns bad. Totally new to me but I am all over making this! Sounds fab! I detest celery, carrots, and cucumbers. I am still recovering from the horrible veggie platters they served when I was in school when they handed out celery sticks every day (what happened to cookies?). I can eat them when they’re chopped finely in vegetable stews, but only when their flavor is overwhelmed by the other veggies. Mmm–just looking at the pictures makes me hungry! I love celeriac, but not such a big fan of remoulade. I make a simple mustard vinaigrette instead, and it really brings out the wonderful taste of “celeri boule” as well! I’ve never made anything with celery root and am now intrigued. This is a great post. Thanks for the mention of the discoloration factor. I discovered celery root last summer when a big one came in our CSA box. We loved it and put apples in a couple of times too. I totally agree with you on regular celery! One more thing – mayo in a TUBE? Seriously? I am struggling with the mental picture. When we were in Paris, my husband and I bought a celery remoulade at a grocery-type store, loved it and I have since tried to recreate it here at home without much success. Now I know that I should be using celeriac instead of celery! Thanks, David, I’m going to go futz with a celery root now. I never liked salad as a kid because my mom ALWAYS put chunks of raw celery in it. Once I figured out it was really just the celery I hated, I started eating salad all the time. I wish I could find somewhere that would just sell a couple stalks of celery for when I need it for cooking. Until then, I’ll just continue to dice it and freeze it for use in stocks, mirepoix, etc. I don’t much like ordinary celery, either, but Asian celery is OK for stir-fried dishes using doufu gan (pressed tofu) available at Chinese groceries (e.g. on Avenue d’Ivry). Even American celery is alright minced as an addition to tuna salad (made with canned US tuna). …but if you’re in France, even the canned tuna is better. Grr. Damned Frenchies. I think I out-terrible you in the store-bought world of celeriac remoulade… when I was in Paris last month, I bought the entire thing premade from a supermarket ;) But hey, I was staying in a hostel, with no kitchen facilities… a girl’s gotta do what a girl’s gotta do, right? JB: That’s s chicken breast, which I marinate in my herb rub with olive oil and grill off on the stovetop. It’s one of my favorite fast, last minute meals. Jean-Marie: Things like ketchup, mustard, and mayo (and tomato paste) are often sold in tubes in Europe. The good thing is they tend to keep longer because less of them are exposed to the air. Krysalia: In English, we say au courant which means “trendy” (or branché, as you mentioned.) I don’t know why we do that, though..
Dan: Celery root is considered very ‘common’ here in France, and the enormous half I bought was only €1. Other root vegetables can be pretty expensive, though, like parsnips. Simple and delicious. I don’t cook much with celery root so this is a much welcomed way for me to use it. Félicitations pour la sortie de ton nouveau livre. J’ai hâte de le lire. Bonne soirée! That’s funny about you not liking celery. I guess skinny people never learn to like it because they don’t have to! Actually the best chicken salad I’ve ever tasted was made with chicken breasts, chopped celery, Hellmann’s mayonnaise, and black olives. Count me in the celery haters club, too. Celeri remoulade though, whole other story! do you think that a grater on a food processor would work well? it just occurred to me that i didn’t have to grate celery root by hand all this time. 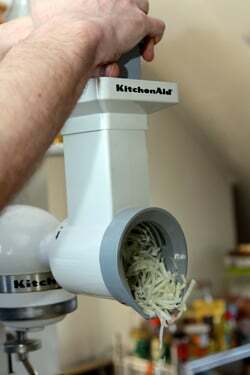 the kitchen-aid mixer attachment looks somewhat like the grate-y thingie for the food processor, no? 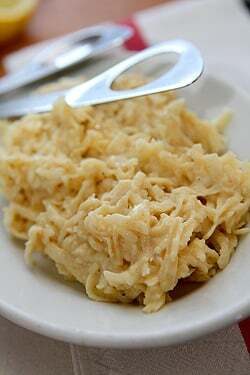 I lived in the French Alps for a while (La Clusaz) and we used to use celeriac like mashed potatoes. Oh my…..there is no other way to describe it but YUM! My life was going along pretty swimmingly today, until I read this recipe. That’s when I saw the photo of the KitchenAid attachment. I knew such a thing existed. It just never occurred to me before that I needed one. Now I have to have it, and it won’t be easy to find in Mexico. This sudden need is brought on by the fact that I wiped out the shaft on my Cuisinart grating blade when I tried to turn 15 lbs. 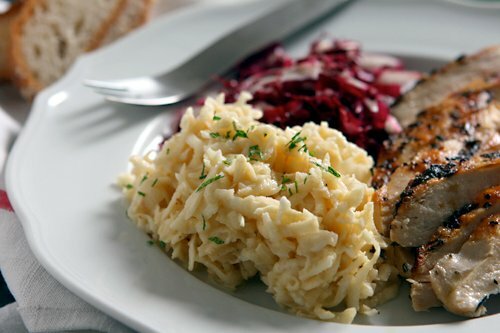 of cabbage into sauerkraut. No celery root in Mexico, so I tried this with jicama. Not a good idea. Too wet. Jicama must be 99% water. So now I’m looking for celery root and a KA grater attachment. I come form Palatinate in Germany, so very close to France. We use a lot of celery root in our cuisine, mostly in soups. I got to like it a little better as an adult, but not that much. It looks like our fridges have the same problem with the celery. I feel bad about tossing it out as well. people always give me crap for disliking celery too! in soups and spreads and everything, it just bugs me. Celery root is so good cooked in heavy cream — with salt added. I also like it with apples, Belgian endive and a vinaigrette dressing with a little honey, parsley and mustard — a Golden Door cookbook recipe. There’s a wonderfully crisp celery and snow pea stir-fry recipe in Madhur Jaffrey’s ‘World Vegetarian’ where they’re cut thinly on the diagonal. It’s really good. Celery should not be dismissed out of hand. It is alkaline and thus a natural remedy for acid reflux. The supermarkets in my part of France sell “céléri branche” by the kilo. It took me a long time to notice that, since in the US it is always sold by the bunch. Go to Leader Price (if there is one anywhere near you). You can buy just as many stalks as you need. I’m with you on celery, and I’ll only make a passing effort at trying to eat it if it’s in a Bloody Mary (and if I’ve already had two). Celery root, yes, another story entirely — thanks for sharing this super-easy, tres French recipe. I just may whip up a batch tonight. I plead guilty to being a huge celery fan. I even eat it just plain. I think I’m in the minority. Thank you for this! I have been looking at those strange, rooty-looking veggies in markets in Paris for almost two years now, wondering what in the hell one does with them. Now I know at least one thing! Actually, two things. New author Elizabeth Bard in her book/cookbook Lunch in Paris has one recipe for it, too. She calls celery root “Frankenstein’s Brain,” which I find appropriate. It does kinda look like how I would imagine Frankenstein’s brain to be. I just want to back up commenter HanMeng up there, too — stalk celery is amazing when chopped up and stir-fried. I used to live in China. I don’t really like raw celery either unless with peanut butter, too, but while I lived there, I learned to stir-fry celery with various meats (pork is common in China, but now I like to stir-fry it with turkey or chicken breast, not being a much of a pork eater). Cooked just enough to make it tender, but crisp enough to have a little crunch, stir-fried celery is wonderful. If you like things spicy a little chili paste or red pepper flakes are very good with it. Thanks again for helping to further solve the mystery of what to do with Frankenstein’s Brain! Back in 1992 when I had a wedding shower, someone gave me a Salad Shooter. I used to use it all the time for stuff like grating cheese and carrots. It would be perfect for shredding celery root. I just looked and they still make them: Salad Shooter dot com. It looks almost identical to your KitchenAid attachment up there, but is free-standing. I’ve never seen celery before!!!! I like all vegetables, I have to try this too!! Thank you!! @Susan I often make it with daikon – crunchy vegetables with a bit of spark are great remouladed! I loathe celery myself, except in cream of celery soup and braised in cream sauce. I think I see the cryptic beginnings of a possible explanation of why I can tolerate it in those two forms. 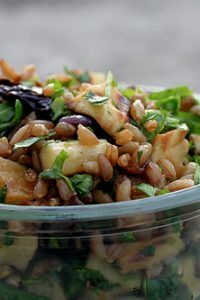 This has to be one of my all time favourite simple salads from France. When I lived there I used to eat it nearly every day and still never got sick of it! Thanks for the memories! This is one of the foods I remember encountering and falling for. I remember where it came from (food counter at Bloomingdale’s) and how it tasted (wonderful). I remember searching about for recipes because it was way before the internet existed. I knew cerery root as a cooked vegetable before celeri remoulade, but we didn’t stretch to is in our home kitchen until Bloomingdale’s. PS/ I use my mandolin to cut it, don’t tell me that’s wrong! It looks like the Moulinex Mouli Julienne is similar to the attachment shredding blades for the Cuisinart. Has anyone compared the two? Lovely, but to give it a kick try adding freshly grated horseraddish. Or shredded carrot and granny Smith apple, various levels of crunchiness. As a kid I was a celery hater and a big celeri remoulade eater (we do know celeriac in Italy, at least in the North – it is called sedano rapa). Nowadays I am not a huge fan of celery, and I substitute celeriac for it in stocks and sauces and soffritti – I actually prefer it. The only real exception where I actually like celery itself is in ‘coda alla vaccinara’ – it is so greasy without celery that you cannot help loving it there! My (french) mother in law makes a celeri-rave salad with vinigrette rather than mayonnaise – that’s pretty good too. I had made them with yoghurt based dressing to cut the podge of mayo – a decent substitute for a bit of creaminess…. I’m with you David — not a huge celery fan either… My mother LOVED it and put it in everything! (Maybe she burned me out…) Anyway, the flavor is sometimes way too strong for me. But I’m always willing to try something new so I’m going to trust you and give this a try. Love Remoulade so this gives me hope for the root. No, dear, you buy a stalk and use a few ribs. This stuff is so good! I love it with a mustardy vinaigrette, and celery root cooked and mashed with potatoes makes a really savory side dish to hearty meats. But in NYC all I can find is small, light-weight roots, not like the huge, dense roots in the French markets. BTW, I checked the Amazon affiliate link for the mouli-julienne and it’s already out of stock. Susan: Yes, I saw that. I don’t know where folks can get one. But if anyone finds another source, feel free to post it here. Lippy: Celery ribs are often referred to as individual stalks as well, according to the Perdue University horticultural center. I do not want to be rude or anything, but this is just a fancy name for very simple celeriac salad. I also do not know if it is French, but this is what my parents and grandparents were making at home for years and they are all Polish. We also add grated apple and sometimes sultanas too. You sound exactly like me husband, who thinks there is absolutely no point to celery that isn’t stuffed with cream cheese or dip. I basically concur; the stuff is somewhat nasty. Except for the very tender paler-than-pale inner stalks that make up the heart. Dare I suggest they are almost delicious? But just try getting a market vendor to sell you only the heart. magda> the funny thing for french people is to hear someone saying that “rémoulade” is a fancy name :D. (I DO understand that for other languages and countries, this word may be seen that way, of course !). Anyway for french people this is hilarious, because to ANY french child, “rémoulade” means “ewww, this school diners old disgusting entree with those vegetables bathing in bad mayo” or at least for those who loved it,rémoulade is a word that contains the idea of every day meals, ultra simple préparation, convenient choice (not to say quite dull). A lot of french people love it as it is also something that makes us nostalgic from good old family lunchs, as are grated carrots or avocado halves with half hard boiled egg and little vegetable with mayonnaise sauce (avocat macédoine). I’m with you on this one – celery root is far more appetising than celery stalks! 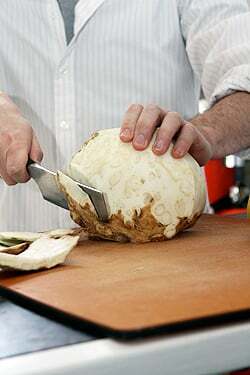 This looks like a great new way for me to cook celery root! I usually turn it into a purée like mashed potatoes, but this looks infinitely more fun. I don’t have a fancy Kitchenaid grater though, do you think a plain old normal one that you use by hand would still grate the root ok? Jenn: While I’d like to say a regular box grater would work well, I think the pieces might be too thin and short, and lose their distinctive crunch. If you have a large chef’s knife, you could cut the celery root pieces into julienne strips (like matchsticks), which isn’t all that difficult, but might take a few more minutes. Krysalia: Yes, in France, this dish is considered anything but fancy. You’re not the first French person to remark that this was something they ate in school quite frequently. All because of you I now have to go back to the supermarket to pick up the celeriac. I had it in my hand the other day and put it down because I was too lazy to make the homemade mayo but you have inspired me to do it. I must have it now! I am one of those strange ones that also loves raw celery. Maybe because we always served in my parents home with cut up fennel and we dipped in in a mixture of olive oil and “Lots” of salt and pepper. My mother usually served after the meal. I’ve never grown celery root, but I may have after this recipe. Although from what I understand, it’s the kind of vegetable that’s more easily purchased than grown. If this recipe is anything like your carrot salad rapees, I’ll be enjoying it often. Merci. We love celeric in our house, and have no trouble managing to find it in stores. We generally boil, and mash – as a subsitute for mashed potatoes with punched up flavour. We must try it this way. btw – your new book arrived Friday night and my 6 year old read it cover to cover over the weekend, he’s requested lime marshmallow pie this weekend, while your peanut butter cookie dough sits in the fridge waiting to be baked off tonight. oh yikes. i happen to loathe celeriac….. this would be the 1 out of 100 posts i’ve read of yours that doesn’t make me drool :) ha ha. but more power to ya! can’t wait to check out the new book! My mom had one of those rotary graters when I was growing up. It was older than me, and she used it to make carrot salad (with bottled mayonnaise and raisins). I don’t know where that thing got to. It looks a bit like my food mill, but different. I love this dish, and I love celery stalks – but both celeriac and celery have to be raw if I’m to eat them. Which, alas, I very, very seldom do as my husband can’t stand either! I could certainly by celery stalks for my own salad but it’s impossible only to buy one or two stalks and it’s such a waste if they go limp in the fridge. I’m afraid I only have céléris rémoulade if I have it as a starter in a cheap French resto, or if I buy a packet of pre-made French salads (usually including carottes rapées and maybe a tabbouleh of some kind – I don’t suppose they are all that good to eat every day, but they do make a change when one only visits France 2 or 3 times a year!). I am one of those lucky people that has a Mouli-julienne. I got mine way back in the 1970s after I saw Julia Child using it on one of her shows. It has lasted all these years, but I dread something happening to the main frame. My blades aren’t pristine anymore, but they still work well. I am not sure that a food processor or grating attachment would give the same shreds that a Mouli-julienne does. The grating disk with the largest holes gives much larger shreds than any food processor attachment has done for me. In France, of course, you can buy it ready made in supermarkets and I have tried to copy it at home in the UK, however I find it is almost impossible to find celeriac in UK markets and supermarkets. I’m often met with blank looks when I ask for it. I’m pleased to see that your recipe is very similar to the one I guessed at and have made at home. The only difference is that the versions I have tried in France seem to have a grainy mustard so the salad is speckled in appearance. It doesn’ look raw or crunchy, but soft and creamy, so looks can be deceiving. Glad to hear a of a different way (for me anyway) of cooking this gnarly old veg. Thank you for straightening me out on condiment tubes. We have traveled in Europe but I guess we were never in need of those things! (I do buy tomato paste in tubes and it’s generally better and more convenient than the stuff in cans). Celeriac is on my shopping list. I have 3 Moulis, two from e-Bay, one from a flea market. I was afraid one would break, so I panicked and bought two more. Used it yesterday for celeri remoulade, which I adore. Do you know, is celery root available at supermarkets in the States? Thanks. Oh I feel so lucky to have that mouli-julienne, a friend of mine brought me many years back, and I’ve been using it a lot to make carrot salad and celery remoulade. I love both of these salad. I must try your version. Jessy: Yes, celery root is available in the United States and usually you can find them in well-stocked supermarkets. Often the bulbs (or roots, I should say) are smaller than the ones I get in France, so I included the weight. 1) Jobuchon’s celery leaf with Roquefort and olive oil is incredible. 2) My remoulade recipe calls for creme fraiche – it’s quite a tasty addition. For Americans, unless you can get French prepared mayo, don’t even think about using store bought – Hellman’s would just be wrong. Ooooh, it is probably too late to get a question answered on this post, I fear. But David, if you read this, can you tell us where to get a moulinex grater in Paris? I think celery is part of a Waldorf Salad – which can be very nice. I can’t say Waldorf Salad without thinking of the classic Fawlty Towers episode. I tend to cut celery into chunky sticks/crudites and then dip the sticks into humous or a Philadelphia Light Chive / Garlic and Herb cream cheese. p.s I had no idea celeriac was the root of celery??!!!!!! Hi David, I love you blog and your recipes and although I’ve never left a comment before I have to do it today! I love green celery (that’s how we call the celery stalks :-)). I couldn’t help myself so I want to share with you a great recipe of celery salad that we eat a lot in Italy ( I live in Milano). It’s easy, light, healthy, fresh…it’s all together and it tastes so good! You have to try it. So mainly all you need is: 1/2 green celery, washed, dried and chopped in 1 cm pieces (cut it in horizontal, do not follow the shape of the stalks, just chop them), 2 cups of Grana Padano cheese flakes (you can use also parmiggiano but I personally think it has a stronger taste and it covers too much the celery flavor…but you can try that version too), 2 tbsp. olive oil, fresh juice of 1 lemon, salt (not that much, the grana is quite salty itself), black pepper and here you go! The most delicious, homemade celery salad. We eat it as an appetizer in Milano or sometimes with meat…it depends. I like it just like that, it’s so refreshing. Your new book was featured in today’s (Austin American Statesman, Austin, Texas) Food and Life Section! My grandma used to prepare a treat for us with unripe wild plums which I so crave for. She would lightly crush them on a grinding stone slab and toss them in a tangy, fragrant and salty herb relish called “dallaar.” The herbs that go in dallaar are all found wild on the hills, brought down by villagers every week for the vegetable bazaar. I miss those days of my childhood, my grandma’s cooking and Iran. Sorry for such a long comment but your pictures of the wild plums were so enticing that I could not resist sharing this memory. This post reminds me of a post on A Hunger Artist . I am a celery hater married to a celery lover but we can agree on celery root. We often add it to soups and to baked root vegetables dishes. Thanks for this recipe which I will try out immediately. And oh bliss, we have a Mouli- julienne. I’ve never worked with celery root before. I’ve always been a little intimidated by it. Definitely willing to give it a shot after seeing how good it looks. How I adore les salade de crudités …and how I hate preparing it. Thank you for this post! 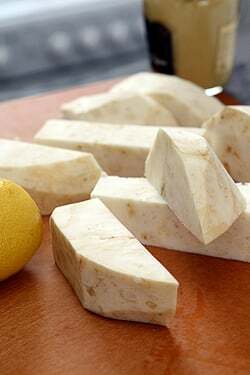 I just got a celery root in my CSA box today and was wondering what to do with it! I lived on celery root salad when I was in France! This is the stuff of wonderful spring memories! Yum! To me, this is perfect picnic food, along with some radishes, good bread, cheese… I adore celery root and, like you, hate celery. Especially when it is cooked and gets, if possible, even more stringy. Ick. Re Becca: I bet it was the same grater my mom had- a big metal thing with different grating attachments. We used to crank and crank the handle for that carrot salad. I think it was (and still is) made by Salad Master, but you have to throw some tupperware-style party to get them. They work very well though. I like this stuff too, but every time I buy celery root here it’s brown and rotten looking in the middle! My original Kitchen Aid mixer has a grater attachment which is probably still available and works nicely on that kind of stuff. I also have the KA grinder attachment for making chopped liver, which would probably be good with the celeriac salad. I put apples in lots of things, so I think I would put it in this too. David, I have tried making this salad twice and the second time I blanched the celeriac before dressing it. It was slightly less crunchy, but seemed more like the remoulades I have had in France before. Is blanching something that is commonly done? As an American who grew up in Paris, I have always loved celery remoulade, but all my efforts to make it at home have been failures. I thought it was the texture: I tried marinating it in a bit of lemon and salt to soften, I tried parboiling, even simmering for a while. Nothing worked to make it come out that lovely crunchy-but-yet-soft way that it is in restaurants. Maybe I’m just grating it wrong. I’ll try a finer julienne. You speak the truth about what it’s like to eat celery. I’d no more munch out on the stuff than I’d eat a scoopful of flour. It’s what happens in the alchemy and heat of the kitchen that makes celery so valuable as a flavoring. Thanks for putting into words with such precision exactly what eating celery is like—and why you and I don’t do it! I like celery just fine, but I made my first celery root remoulade a few weeks ago and realized that there is a reason some dishes become classics.I had never eaten it before at all, now it will be a mainstay. I don’t think it suffers from use of good quality store mayo (I’m a big Hellmann’s fan myself). Just found your blog, by reading the magazine Maison …. Wrote about you on my blog…hope that´s oki? Funny you should write about this. I had a craving the other day and hunted up Julia Child’s recipe. I think it’s even better the second day, though not as crunchy. Really enjoy reading your blog. I am like you: I don’t care for celery itself, but I had celery root for the first time a couple years ago in France and I couldn’t believe how good it was. So, I am going to hunt for some root here and attempt your salad recipe. Thx. Oh, oh, I live in the states and have a moulinex rotary hand grater, given to me by my grandmother who NEVER OPENED THE BOX, and I’ve been unwittingly making celery root remoulade with it for years not knowing I was part of an exclusive group of moulinex rotary hand grater owners in the US. I feel very special now, and ignored your mention of auction sites, so that I can feel even specialer, since I got one as a hand-me-down. AN UNUSED hand-me-down. Celery and peanut butter…. DAVID! Quelle horreur!!! I made celery root remoulade and your fresh ginger cake from the new book today when my boyfriend’s mother stopped over for lunch. Both were a hit! Thanks for the ideas and recipes! Sautee the chopped onion with about 3 T of virgin olive oil in a pot. Add the other vegetables cut into 2-cm cubes and continue sauteeing a few minutes more. Add a cup of orange juice and salt. After it starts to boil cover the lid and let it cook for about 20 minutes or just until the vegetables are more or less softened. Can be eaten at room temperatur or cold. Celeriac is a completely different vegetable from celery. They are members of the same family, but celeriac is not the root of the same celery that you buy in the supermarket. I’ve never heard it called celery root before, seems a bit confusing. Celeriac soup is quite wonderful, by the way. This looks really good. I will never think of celeriac the same way again. Definitely going to pick some up and try this recipe soon. So, they sell them in France? Awhile back, I was looking for the moulinex food mill but couldn’t find any so I assumed they stopped making them. When you go to the UK Moulinex website, I couldn’t find them there either. There’s France Amazon, but since I’ve forgotten my high school French, I assumed it was saying in French that the product wasn’t available either. Now, that I have that figured out, the last hurrdle I have with celery root remoluade is celery root, or at least, knowing how to pick one out. To me, the crispy texture of the celery root is just as important, if not more, than the flavor. But, a lot of times, I end up with a celery root that’s all squishy. I have no idea how to differentiate what will be a cripsy celery root vs. a squishy celery root in the grocery store. My partner and I have taken our bikes to France 3 x and cycled extensively in various regions, north and south in France, as well as Paris. Because we would always be buying our daily groceries at les épiceries, it didn’t take long for me to become addicted to my daily little carton of Céleri Rémoulade. I would often get the grated carrottes , located adjacent, but it was the celeriac, that I loved, loved, loved. A humble , simple food with a nice little sharpness to it, drenched in mayonnaise. I remember running into a grocery store with 10 minutes to buy some food, before we stuffed ourselves, our bikes, and our day bags onto the train at Monaco, headed for Montpelier, a few hours along the coast. Once home, I managed to find an orange-coloured, plastic, hand-turned rotary grater mouli-julienne by Moulinex at a second hand store in Portland. But I have not easily been able to come across celeriac in my native Canada, nor do the grocers even know what it is. Quel dommage! Many “thank yous” David for your lovely blog, which brings happy memories of all kinds. Just a little tip; when I have leftover celery sticks, usually the tough outer ones, I just pop them in the freezer (raw) “for stock”. Put them in the stock while still frozen, and they’ll release their juices within minutes, because the cell membranes will have been broken up by the freezing process.